1. When combat begins, all combatants roll initiative. 2. Determine which characters are aware of their opponents. These characters can act during a surprise round. If all the characters are aware of their opponents, proceed with normal rounds. See the surprise section for more information. 3. After the surprise round (if any), all combatants are ready to being the first normal round of combat. 5. When everyone has had a turn, the next round begins with the combatant with the highest initiative, and steps 4 and 5 repeat until combat ends. When the rules refer to a "full round", they usually mean a span of time from a particular initiative count in one round to the same initiative count in the next round. Effects that last a certain number of rounds end just before the same initiative count that they began on. Flat-Footed: At the start of a battle, before you have had a chance to act (specifically, before your first regular turn in the initiative order), you are flat-footed. You can't use your Dexterity bonus to AC (if any) while flat-footed. Barbarians and rogues of high enough level have the uncanny dodge extraordinary ability, which means that they cannot be caught flat-footed. Characters with uncanny dodge retain their Dexterity bonus to their AC and can make attacks of opportunity before they have acted in the first round of combat. A flat-footed character can't make attacks of opportunity, unless he has the Combat Reflexes feat. An attack roll represents your attempt to strike your opponent on your turn in a round. When you make an attack roll, you roll a d20 and add your attack bonus. (Other modifiers may also apply to this roll.) If your result equals or beats the target's Armor Class, you hit and deal damage. Automatic Misses and Hits: A natural 1 (the d20 comes up 1) on an attack roll is always a miss. A natural 20 (the d20 comes up 20) is always a hit. A natural 20 is also a threat—a possible critical hit (see the attack action). Note that armor limits your Dexterity bonus, so if you're wearing armor, you might not be able to apply your whole Dexterity bonus to your AC (see Table: Armor and Shields). Enhancement Bonuses: Enhancement bonuses apply to your armor to increase the armor bonus it provides. Natural Armor: If your race has a tough hide, scales, or thick skin you receive a bonus to your AC. Dodge Bonuses: Dodge bonuses represent actively avoiding blows. Any situation that denies you your Dexterity bonus also denies you dodge bonuses. (Wearing armor, however, does not limit these bonuses the way it limits a Dexterity bonus to AC.) Unlike most sorts of bonuses, dodge bonuses stack with each other. Size Modifier: You receive a bonus or penalty to your AC based on your size. See Table: Size Modifiers. Touch Attacks: Some attacks completely disregard armor, including shields and natural armor—the aggressor need only touch a foe for such an attack to take full effect. In these cases, the attacker makes a touch attack roll (either ranged or melee). When you are the target of a touch attack, your AC doesn't include any armor bonus, shield bonus, or natural armor bonus. All other modifiers, such as your size modifier, Dexterity modifier, and deflection bonus (if any) apply normally. Some creatures have the ability to make incorporeal touch attacks. These attacks bypass solid objects, such as armor and shields, by passing through them. Incorporeal touch attacks work similarly to normal touch attacks except that they also ignore cover bonuses. Incorporeal touch attacks do not ignore armor bonuses granted by force effects, such as mage armor and bracers of armor. Damage reduces a target's current hit points. Minimum Damage: If penalties reduce the damage result to less than 1, a hit still deals 1 point of nonlethal damage. Strength Bonus: When you hit with a melee or thrown weapon, including a sling, add your Strength modifier to the damage result. A Strength penalty, but not a bonus, applies on damage rolls made with a bow that is not a composite bow. Off-Hand Weapon: When you deal damage with a weapon in your off hand, you add only 1/2 your Strength bonus. If you have a Strength penalty, the entire penalty applies. Wielding a Weapon Two-Handed: When you deal damage with a weapon that you are wielding two-handed, you add 1-1/2 times your Strength bonus (Strength penalties are not multiplied). You don't get this higher Strength bonus, however, when using a light weapon with two hands. Multiplying Damage: Sometimes you multiply damage by some factor, such as on a critical hit. Roll the damage (with all modifiers) multiple times and total the results. Exception: Extra damage dice over and above a weapon's normal damage are never multiplied. Ability Damage: Certain creatures and magical effects can cause temporary or permanent ability damage (a reduction to an ability score). When your hit point total reaches 0, you're disabled. When it reaches –1, you're dying. When it gets to a negative amount equal to your Constitution score, you're dead. See Injury and Death, for more information. Threatened Squares: You threaten all squares into which you can make a melee attack, even when it is not your turn. Generally, that means everything in all squares adjacent to your space (including diagonally). An enemy that takes certain actions while in a threatened square provokes an attack of opportunity from you. If you're unarmed, you don't normally threaten any squares and thus can't make attacks of opportunity. Provoking an Attack of Opportunity: Two kinds of actions can provoke attacks of opportunity: moving out of a threatened square and performing certain actions within a threatened square. Moving: Moving out of a threatened square usually provokes attacks of opportunity from threatening opponents. There are two common methods of avoiding such an attack—the 5-foot step and the withdraw action. Making an Attack of Opportunity: An attack of opportunity is a single melee attack, and most characters can only make one per round. You don't have to make an attack of opportunity if you don't want to. You make your attack of opportunity at your normal attack bonus, even if you've already attacked in the round. An attack of opportunity "interrupts" the normal flow of actions in the round. If an attack of opportunity is provoked, immediately resolve the attack of opportunity, then continue with the next character's turn (or complete the current turn, if the attack of opportunity was provoked in the midst of a character's turn). Combat Reflexes and Additional Attacks of Opportunity: If you have the Combat Reflexes feat, you can add your Dexterity bonus to the number of attacks of opportunity you can make in a round. This feat does not let you make more than one attack for a given opportunity, but if the same opponent provokes two attacks of opportunity from you, you could make two separate attacks of opportunity (since each one represents a different opportunity). Moving out of more than one square threatened by the same opponent in the same round doesn't count as more than one opportunity for that opponent. All these attacks are at your full normal attack bonus. Reflex: These saves test your ability to dodge area attacks and unexpected situations. Apply your Dexterity modifier to your Reflex saving throws. An action's type essentially tells you how long the action takes to perform (within the framework of the 6-second combat round) and how movement is treated. There are six types of actions: standard actions, move actions, full-round actions, swift actions, immediate actions, and free actions. Standard Action: A standard action allows you to do something, most commonly to make an attack or cast a spell. See Table: Actions in Combat for other standard actions. Move Action: A move action allows you to move up to your speed or perform an action that takes a similar amount of time. See Table: Actions in Combat for other move actions. Full-Round Action: A full-round action consumes all your effort during a round. The only movement you can take during a full-round action is a 5-foot step before, during, or after the action. You can also perform free actions and swift actions (see below). See Table: Actions in Combat for a list of full-round actions. Free Action: Free actions consume a very small amount of time and effort. You can perform one or more free actions while taking another action normally. However, there are reasonable limits on what you can really do for free, as decided by the GM. Swift Action: A swift action consumes a very small amount of time, but represents a larger expenditure of effort and energy than a free action. You can perform only a single swift action per turn. Immediate Action: An immediate action is very similar to a swift action, but can be performed at any time—even if it's not your turn. Not an Action: Some activities are so minor that they are not even considered free actions. They literally don't take any time at all to do and are considered an inherent part of doing something else, such as nocking an arrow as part of an attack with a bow. Restricted Activity: In some situations, you may be unable to take a full round's worth of actions. In such cases, you are restricted to taking only a single standard action or a single move action (plus free and swift actions as normal). You can't take a full-round action (though you can start or complete a full-round action by using a standard action; see below). An unarmed character can't take attacks of opportunity (but see "Armed" Unarmed Attacks, below). "Armed" Unarmed Attacks: Sometimes a character's or creature's unarmed attack counts as an armed attack. A monk, a character with the Improved Unarmed Strike feat, a spellcaster delivering a touch attack spell, and a creature with natural physical weapons all count as being armed (see natural attacks). Unarmed Strike Damage: An unarmed strike from a Medium character deals 1d3 points of bludgeoning damage (plus your Strength modifier, as normal). A Small character's unarmed strike deals 1d2 points of bludgeoning damage, while a Large character's unarmed strike deals 1d4 points of bludgeoning damage. All damage from unarmed strikes is nonlethal damage. Unarmed strikes count as light weapons (for purposes of two-weapon attack penalties and so on). Ranged Attacks: With a ranged weapon, you can shoot or throw at any target that is within the weapon's maximum range and in line of sight. The maximum range for a thrown weapon is five range increments. For projectile weapons, it is 10 range increments. Some ranged weapons have shorter maximum ranges, as specified in their descriptions. Natural Attacks: Attacks made with natural weapons, such as claws and bites, are melee attacks that can be made against any creature within your reach (usually 5 feet). These attacks are made using your full attack bonus and deal an amount of damage that depends on their type (plus your Strength modifier, as normal). You do not receive additional natural attacks for a high base attack bonus. Instead, you receive additional attack rolls for multiple limb and body parts capable of making the attack (as noted by the race or ability that grants the attacks). If you possess only one natural attack (such as a bite—two claw attacks do not qualify), you add 1–1/2 times your Strength bonus on damage rolls made with that attack. Multiple Attacks: A character who can make more than one attack per round must use the full-attack action (see Full-Round Actions) in order to get more than one attack. If your target (or the part of your target you're aiming at, if it's a big target) is at least 10 feet away from the nearest friendly character, you can avoid the –4 penalty, even if the creature you're aiming at is engaged in melee with a friendly character. Precise Shot: If you have the Precise Shot feat, you don't take this penalty. Fighting Defensively as a Standard Action: You can choose to fight defensively when attacking. If you do so, you take a –4 penalty on all attacks in a round to gain a +2 dodge bonus to AC until the start of your next turn. Critical Hits: When you make an attack roll and get a natural 20 (the d20 shows 20), you hit regardless of your target's Armor Class, and you have scored a "threat," meaning the hit might be a critical hit (or "crit"). To find out if it's a critical hit, you immediately make an attempt to "confirm" the critical hit—another attack roll with all the same modifiers as the attack roll you just made. If the confirmation roll also results in a hit against the target's AC, your original hit is a critical hit. (The critical roll just needs to hit to give you a crit, it doesn't need to come up 20 again.) If the confirmation roll is a miss, then your hit is just a regular hit. Exception: Precision damage (such as from a rogue's sneak attack class feature) and additional damage dice from special weapon abilities (such as flaming) are not multiplied when you score a critical hit. Increased Critical Multiplier: Some weapons deal better than double damage on a critical hit (see Equipment). Spells and Critical Hits: A spell that requires an attack roll can score a critical hit. A spell attack that requires no attack roll cannot score a critical hit. If a spell causes ability damage or drain (see Special Abilities), the damage or drain is doubled on a critical hit. Many magic items don't need to be activated. Certain magic items, however, do need to be activated, especially potions, scrolls, wands, rods, and staves. Unless otherwise noted, activating a magic item is a standard action. Concentration: You must concentrate to cast a spell. If you can't concentrate, you can't cast a spell. If you start casting a spell but something interferes with your concentration, you must make a concentration check or lose the spell. The check's DC depends on what is threatening your concentration (see Magic). If you fail, the spell fizzles with no effect. If you prepare spells, it is lost from preparation. If you cast at will, it counts against your daily limit of spells even though you did not cast it successfully. Attacks of Opportunity: Generally, if you cast a spell, you provoke attacks of opportunity from threatening enemies. If you take damage from an attack of opportunity, you must make a concentration check (DC 10 + points of damage taken + the spell's level) or lose the spell. Spells that require only a free action to cast don't provoke attacks of opportunity. Casting on the Defensive: Casting a spell while on the defensive does not provoke an attack of opportunity. It does, however, require a concentration check (DC 15 + double the spell's level) to successfully cast the spell. Failure means that you lose the spell. Touch Attacks: Touching an opponent with a touch spell is considered to be an armed attack and therefore does not provoke attacks of opportunity. The act of casting a spell, however, does provoke an attack of opportunity. Touch attacks come in two types: melee touch attacks and ranged touch attacks. You can score critical hits with either type of attack as long as the spell deals damage. Your opponent's AC against a touch attack does not include any armor bonus, shield bonus, or natural armor bonus. His size modifier, Dexterity modifier, and deflection bonus (if any) all apply normally. Holding the Charge: If you don't discharge the spell in the round when you cast the spell, you can hold the charge indefinitely. You can continue to make touch attacks round after round. If you touch anything or anyone while holding a charge, even unintentionally, the spell discharges. If you cast another spell, the touch spell dissipates. You can touch one friend as a standard action or up to six friends as a full-round action. Alternatively, you may make a normal unarmed attack (or an attack with a natural weapon) while holding a charge. In this case, you aren't considered armed and you provoke attacks of opportunity as normal for the attack. If your unarmed attack or natural weapon attack normally doesn't provoke attacks of opportunity, neither does this attack. If the attack hits, you deal normal damage for your unarmed attack or natural weapon and the spell discharges. If the attack misses, you are still holding the charge. Ranged Touch Spells in Combat: Some spells allow you to make a ranged touch attack as part of the casting of the spell. These attacks are made as part of the spell and do not require a separate action. Ranged touch attacks provoke an attack of opportunity, even if the spell that causes the attacks was cast defensively. Unless otherwise noted, ranged touch attacks cannot be held until a later turn. The "start full-round action" standard action lets you start undertaking a full-round action, which you can complete in the following round by using another standard action. You can't use this action to start or complete a full attack, charge, run, or withdraw. Spell-Like Abilities (Sp): Using a spell-like ability works like casting a spell in that it requires concentration and provokes attacks of opportunity. Spell-like abilities can be disrupted. If your concentration is broken, the attempt to use the ability fails, but the attempt counts as if you had used the ability. The casting time of a spell-like ability is 1 standard action, unless the ability description notes otherwise. Using a Spell-Like Ability on the Defensive: You may attempt to use a spell-like ability on the defensive, just as with casting a spell. If the concentration check (DC 15 + double the spell's level) fails, you can't use the ability, but the attempt counts as if you had used the ability. Supernatural Abilities (Su): Using a supernatural ability is usually a standard action (unless defined otherwise by the ability's description). Its use cannot be disrupted, does not require concentration, and does not provoke attacks of opportunity. Extraordinary Abilities (Ex): Using an extraordinary ability is usually not an action because most extraordinary abilities automatically happen in a reactive fashion. Those extraordinary abilities that are actions are usually standard actions that cannot be disrupted, do not require concentration, and do not provoke attacks of opportunity. Fast Mount or Dismount: You can mount or dismount as a free action with a DC 20 Ride check. If you fail the check, mounting or dismounting is a move action instead. You can't attempt a fast mount or fast dismount unless you can perform the mount or dismount as a move action in the current round. Deciding between an Attack or a Full Attack: After your first attack, you can decide to take a move action instead of making your remaining attacks, depending on how the first attack turns out and assuming you have not already taken a move action this round. If you've already taken a 5-foot step, you can't use your move action to move any distance, but you could still use a different kind of move action. Fighting Defensively as a Full-Round Action: You can choose to fight defensively when taking a full-attack action. If you do so, you take a –4 penalty on all attacks in a round to gain a +2 dodge bonus to AC for until the start your next turn. You only provoke attacks of opportunity when you begin casting a spell, even though you might continue casting for at least 1 full round. While casting a spell, you don't threaten any squares around you. Casting a Metamagic Spell: Sorcerers and bards must take more time to cast a metamagic spell (one enhanced by a metamagic feat) than a regular spell. If a spell's normal casting time is 1 standard action, casting a metamagic version of the spell is a full-round action for a sorcerer or bard (except for spells modified by the Quicken Spell feat, which take 1 swift action to cast). Note that this isn't the same as a spell with a 1-round casting time. Spells that take a full-round action to cast take effect in the same round that you begin casting, and you are not required to continue the invocations, gestures, and concentration until your next turn. For spells with a longer casting time, it takes an extra full-round action to cast the metamagic spell. In general, speaking is a free action that you can perform even when it isn't your turn. Speaking more than a few sentences is generally beyond the limit of a free action. You can cast a quickened spell (see the Quicken Spell feat), or any spell whose casting time is designated as a free or swift action, as a swift action. Only one such spell can be cast in any round, and such spells don't count toward your normal limit of one spell per round. Casting a spell as a swift action doesn't incur an attack of opportunity. Much like a swift action, an immediate action consumes a very small amount of time but represents a larger expenditure of effort and energy than a free action. However, unlike a swift action, an immediate action can be performed at any time—even if it's not your turn. Casting feather fall is an immediate action, since the spell can be cast at any time. Your hit points measure how hard you are to kill. No matter how many hit points you lose, your character isn't hindered in any way until your hit points drop to 0 or lower. What Hit Points Represent: Hit points mean two things in the game world: the ability to take physical punishment and keep going, and the ability to turn a serious blow into a less serious one. Effects of Hit Point Damage: Damage doesn't slow you down until your current hit points reach 0 or lower. At 0 hit points, you're disabled. When your negative hit point total is equal to your Constitution, you're dead. Massive Damage (Optional Rule): If you ever sustain a single attack that deals an amount of damage equal to half your total hit points (minimum 50 points of damage) or more and it doesn't kill you outright, you must make a DC 15 Fortitude save. If this saving throw fails, you die regardless of your current hit points. If you take half your total hit points or more in damage from multiple attacks, no one of which dealt more than half your total hit points (minimum 50), the massive damage rule does not apply. Healing that raises your hit points above 0 makes you fully functional again, just as if you'd never been reduced to 0 or fewer hit points. You can also become disabled when recovering from dying. In this case, it's a step toward recovery, and you can have fewer than 0 hit points (see Stable Characters and Recovery). If your hit point total is negative, but not equal to or greater than your Constitution score, you're dying. When your character's current hit points drop to a negative amount equal to his Constitution score or lower, or if he succumbs to massive damage, he's dead. A character can also die from taking ability damage or suffering an ability drain that reduces his Constitution score to 0 (see Special Abilities). Certain types of powerful magic, such as raise dead and resurrection, can restore life to a dead character. See Magic for more information. On the character's next turn, after being reduced to negative hit points (but not dead), and on all subsequent turns, the character must make a DC 10 Constitution check to become stable. The character takes a penalty on this roll equal to his negative hit point total. A character that is stable does not need to make this check. A natural 20 on this check is an automatic success. If the character fails this check, he loses 1 hit point. An unconscious or dying character cannot use any special action that changes the initiative count on which his action occurs. Healing that raises the dying character's hit points to 0 makes him conscious and disabled. Healing that raises his hit points to 1 or more makes him fully functional again, just as if he'd never been reduced to 0 or lower. A spellcaster retains the spellcasting capability she had before dropping below 0 hit points. Recovering with Help: One hour after a tended, dying character becomes stable, the character must make a DC 10 Constitution check to become conscious. The character takes a penalty on this roll equal to his negative hit point total. Conscious characters with negative hit point totals are treated as disabled characters. If the character remains unconscious, he receives another check every hour to regain consciousness. A natural 20 on this check is an automatic success. Even if unconscious, the character recovers hit points naturally. He automatically regains consciousness when his hit points rise to 1 or higher. Recovering without Help: A severely wounded character left alone usually dies. He has a small chance of recovering on his own. Treat such characters as those attempting to recover with help, but every failed Constitution check to regain consciousness results in the loss of 1 hit point. An unaided character does not recover hit points naturally. Once conscious, the character can make a DC 10 Constitution check once per day, after resting for 8 hours, to begin recovering hit points naturally. The character takes a penalty on this roll equal to his negative hit point total. Failing this check causes the character to lose 1 hit point, but this does not cause the character to become unconscious. Once a character makes this check, he continues to heal naturally and is no longer in danger of losing hit points naturally. After taking damage, you can recover hit points through natural healing or through magical healing. In any case, you can't regain hit points past your full normal hit point total. Natural Healing: With a full night's rest (8 hours of sleep or more), you recover 1 hit point per character level. Any significant interruption during your rest prevents you from healing that night. Magical Healing: Various abilities and spells can restore hit points. Healing Limits: You can never recover more hit points than you lost. Magical healing won't raise your current hit points higher than your full normal hit point total. Healing Ability Damage: Temporary ability damage returns at the rate of 1 point per night of rest (8 hours) for each affected ability score. Complete bed rest restores 2 points per day (24 hours) for each affected ability score. Increases in Constitution Score and Current Hit Points: An increase in a character's Constitution score, even a temporary one, can give her more hit points (an effective hit point increase), but these are not temporary hit points. They can be restored, and they are not lost first as temporary hit points are. Dealing Nonlethal Damage: Certain attacks deal nonlethal damage. Other effects, such as heat or being exhausted, also deal nonlethal damage. When you take nonlethal damage, keep a running total of how much you've accumulated. Do not deduct the nonlethal damage number from your current hit points. It is not "real" damage. Instead, when your nonlethal damage equals your current hit points, you're staggered (see below), and when it exceeds your current hit points, you fall unconscious. Staggered and Unconscious: When your nonlethal damage equals your current hit points, you're staggered. You can only take a standard action or a move action in each round (in addition to free, immediate, and swift actions). You cease being staggered when your current hit points once again exceed your nonlethal damage. If a creature's nonlethal damage is equal to his total maximum hit points (not his current hit points), all further nonlethal damage is treated as lethal damage. This does not apply to creatures with regeneration. Such creatures simply accrue additional nonlethal damage, increasing the amount of time they remain unconscious. Healing Nonlethal Damage: You heal nonlethal damage at the rate of 1 hit point per hour per character level. When a spell or ability cures hit point damage, it also removes an equal amount of nonlethal damage. Encumbrance: A character encumbered by carrying treasure, a large amount of gear, or fallen comrades may move slower than normal (see Additional Rules). Hampered Movement: Difficult terrain, obstacles, or poor visibility can hamper movement. Movement in Combat: Generally, you can move your speed in a round and still do something (take a move action and a standard action). Bonuses to Speed: A barbarian has a +10-foot bonus to his speed (unless she's wearing heavy armor). Experienced monks also have higher speed (unless they're wearing armor of any sort). In addition, many spells and magic items can affect a character's speed. Always apply any modifiers to a character's speed before adjusting the character's speed based on armor or encumbrance, and remember that multiple bonuses of the same type to a character's speed don't stack. Diagonals: When measuring distance, the first diagonal counts as 1 square, the second counts as 2 squares, the third counts as 1, the fourth as 2, and so on. You can't move diagonally past a corner (even by taking a 5-foot step). You can move diagonally past a creature, even an opponent. Friend: You can move through a square occupied by a friendly character, unless you are charging. When you move through a square occupied by a friendly character, that character doesn't provide you with cover. Opponent: You can't move through a square occupied by an opponent unless the opponent is helpless. You can move through a square occupied by a helpless opponent without penalty. Some creatures, particularly very large ones, may present an obstacle even when helpless. In such cases, each square you move through counts as 2 squares. Tumbling: A trained character can attempt to use Acrobatics to move through a square occupied by an opponent (see the Acrobatics skill). Square Occupied by Creature Three Sizes Larger or Smaller: Any creature can move through a square occupied by a creature three size categories larger than itself. Designated Exceptions: Some creatures break the above rules. A creature that completely fills the squares it occupies cannot be moved past, even with the Acrobatics skill or similar special abilities. Difficult Terrain: Difficult terrain, such as heavy undergrowth, broken ground, or steep stairs, hampers movement. Each square of difficult terrain counts as 2 squares of movement. Each diagonal move into a difficult terrain square counts as 3 squares. You can't run or charge across difficult terrain. Obstacles: Like difficult terrain, obstacles can hamper movement. If an obstacle hampers movement but doesn't completely block it, each obstructed square or obstacle between squares counts as 2 squares of movement. You must pay this cost to cross the obstacle, in addition to the cost to move into the square on the other side. If you don't have sufficient movement to cross the obstacle and move into the square on the other side, you can't cross it. Some obstacles may also require a skill check to cross. On the other hand, some obstacles block movement entirely. A character can't move through a blocking obstacle. Squeezing: In some cases, you may have to squeeze into or through an area that isn't as wide as the space you take up. You can squeeze through or into a space that is at least half as wide as your normal space. Each move into or through a narrow space counts as if it were 2 squares, and while squeezed in a narrow space, you take a –4 penalty on attack rolls and a –4 penalty to AC. When a Large creature (which normally takes up 4 squares) squeezes into a space that's 1 square wide, the creature's miniature figure occupies 2 squares, centered on the line between the 2 squares. For a bigger creature, center the creature likewise in the area it squeezes into. A creature can squeeze past a creature while moving but it can't end its movement in an occupied square. To squeeze through or into a space less than half your space's width, you must use the Escape Artist skill. You can't attack while using Escape Artist to squeeze through or into a narrow space, you take a –4 penalty to AC, and you lose any Dexterity bonus to AC. Accidentally Ending Movement in an Illegal Space: Sometimes a character ends its movement while moving through a space where it's not allowed to stop. When that happens, put your miniature in the last legal position you occupied, or the closest legal position, if there's a legal position that's closer. Minimum Movement: Despite whatever penalties to movement you might have, you can take a full-round action to move 5 feet (1 square) in any direction, even diagonally. This rule doesn't allow you to move through impassable terrain or to move when all movement is prohibited. Such movement provokes attacks of opportunity as normal (despite the distance covered, this move isn't a 5-foot step). The fighter's first move costs him 5 feet (or 1 square). His next costs 5 feet also, but his third (his 2nd diagonal) costs him 10 feet. Next he moves into difficult terrain, also costing him 10 feet. At this point (#6), the fighter has moved 30 feet—one move action. The last square is a diagonal move in difficult terrain, which costs 15 feet; he must spend his turn's standard action to move this far. 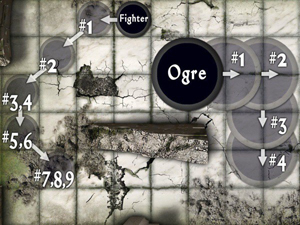 The Large ogre's move costs a total of 20 feet worth of movement (or 4 squares). 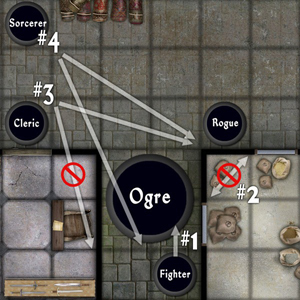 The ogre cannot cut across the corner to get to that location, and must fully move around it, as indicated. Tiny, Diminutive, and Fine Creatures: Very small creatures take up less than 1 square of space. This means that more than one such creature can fit into a single square. A Tiny creature typically occupies a space only 2-1/2 feet across, so four can fit into a single square. 25 Diminutive creatures or 100 Fine creatures can fit into a single square. Creatures that take up less than 1 square of space typically have a natural reach of 0 feet, meaning they can't reach into adjacent squares. They must enter an opponent's square to attack in melee. This provokes an attack of opportunity from the opponent. You can attack into your own square if you need to, so you can attack such creatures normally. Since they have no natural reach, they do not threaten the squares around them. You can move past them without provoking attacks of opportunity. They also can't flank an enemy. Large, Huge, Gargantuan, and Colossal Creatures: Very large creatures take up more than 1 square. Creatures that take up more than 1 square typically have a natural reach of 10 feet or more, meaning that they can reach targets even if they aren't in adjacent squares. Large or larger creatures using reach weapons can strike up to double their natural reach but can't strike at their natural reach or less. A number of factors and conditions can influence an attack roll. Many of these situations grant a bonus or penalty on attack rolls or to a defender's Armor Class. To determine whether your target has cover from your ranged attack, choose a corner of your square. If any line from this corner to any corner of the target's square passes through a square or border that blocks line of effect or provides cover, or through a square occupied by a creature, the target has cover (+4 to AC). When making a melee attack against an adjacent target, your target has cover if any line from any corner of your square to the target's square goes through a wall (including a low wall). When making a melee attack against a target that isn't adjacent to you (such as with a reach weapon), use the rules for determining cover from ranged attacks. Low Obstacles and Cover: A low obstacle (such as a wall no higher than half your height) provides cover, but only to creatures within 30 feet (6 squares) of it. The attacker can ignore the cover if he's closer to the obstacle than his target. Cover and Attacks of Opportunity: You can't execute an attack of opportunity against an opponent with cover relative to you. Partial Cover: If a creature has cover, but more than half the creature is visible, its cover bonus is reduced to a +2 to AC and a +1 bonus on Reflex saving throws. This partial cover is subject to the GM's discretion. Total Cover: If you don't have line of effect to your target (that is, you cannot draw any line from your square to your target's square without crossing a solid barrier), he is considered to have total cover from you. You can't make an attack against a target that has total cover. #2: The rogue is adjacent to the ogre, but lines from the corners of her square to the corners of the ogre's square cross through a wall. The ogre has melee cover from her, but if it attacks her, the rogue does not have cover from it, as the ogre has reach (so it figures attacks as if attacking with a ranged weapon). To determine whether your target has concealment from your ranged attack, choose a corner of your square. If any line from this corner to any corner of the target's square passes through a square or border that provides concealment, the target has concealment. When making a melee attack against an adjacent target, your target has concealment if his space is entirely within an effect that grants concealment. When making a melee attack against a target that isn't adjacent to you, use the rules for determining concealment from ranged attacks. Total Concealment: If you have line of effect to a target but not line of sight, he is considered to have total concealment from you. You can't attack an opponent that has total concealment, though you can attack into a square that you think he occupies. A successful attack into a square occupied by an enemy with total concealment has a 50% miss chance (instead of the normal 20% miss chance for an opponent with concealment). You can't execute an attack of opportunity against an opponent with total concealment, even if you know what square or squares the opponent occupies. Ignoring Concealment: Concealment isn't always effective. An area of dim lighting or darkness doesn't provide any concealment against an opponent with darkvision. Characters with low-light vision can see clearly for a greater distance than other characters with the same light source. Although invisibility provides total concealment, sighted opponents may still make Perception checks to notice the location of an invisible character. An invisible character gains a +20 bonus on Stealth checks if moving, or a +40 bonus on Stealth checks when not moving (even though opponents can't see you, they might be able to figure out where you are from other visual or auditory clues). When in doubt about whether two characters flank an opponent in the middle, trace an imaginary line between the two attackers' centers. If the line passes through opposite borders of the opponent's space (including corners of those borders), then the opponent is flanked. Creatures with a reach of 0 feet can't flank an opponent. 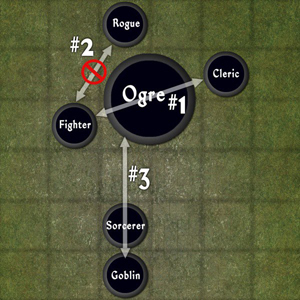 #3: The goblin and the ogre flank the sorcerer, as they can draw a line between them that passes through opposite sides of the sorcerer's square. If the ogre didn't have reach to the sorcerer, though, he and the goblin would not be flanking her. Coup de Grace: As a full-round action, you can use a melee weapon to deliver a coup de grace (pronounced "coo day grahs") to a helpless opponent. You can also use a bow or crossbow, provided you are adjacent to the target. 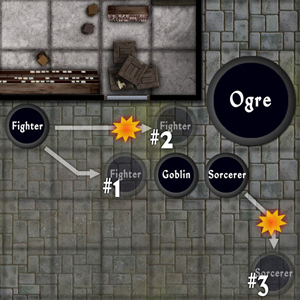 This section discusses all of the various standard maneuvers you can perform during combat other than normal attacks, casting spells, or using other class abilities. Some of these special attacks can be made as part of another action (such as an attack) or as an attack of opportunity. Movement During a Charge: You must move before your attack, not after. You must move at least 10 feet (2 squares) and may move up to double your speed directly toward the designated opponent. If you move a distance equal to your speed or less, you can also draw a weapon during a charge attack if your base attack bonus is at least +1. You must have a clear path toward the opponent, and nothing can hinder your movement (such as difficult terrain or obstacles). You must move to the closest space from which you can attack the opponent. If this space is occupied or otherwise blocked, you can't charge. If any line from your starting space to the ending space passes through a square that blocks movement, slows movement, or contains a creature (even an ally), you can't charge. Helpless creatures don't stop a charge. If you don't have line of sight to the opponent at the start of your turn, you can't charge that opponent. You can't take a 5-foot step in the same round as a charge. If you are able to take only a standard action on your turn, you can still charge, but you are only allowed to move up to your speed (instead of up to double your speed) and you cannot draw a weapon unless you possess the Quick Draw feat. You can't use this option unless you are restricted to taking only a standard action on your turn. Creatures that are size Tiny or smaller use their Dexterity modifier in place of their Strength modifier to determine their CMB. The special size modifier for a creature's Combat Maneuver Bonus is as follows: Fine –8, Diminutive –4, Tiny –2, Small –1, Medium +0, Large +1, Huge +2, Gargantuan +4, Colossal +8. Some feats and abilities grant a bonus to your CMB when performing specific maneuvers. When you attempt to perform a combat maneuver, make an attack roll and add your CMB in place of your normal attack bonus. Add any bonuses you currently have on attack rolls due to spells, feats, and other effects. These bonuses must be applicable to the weapon or attack used to perform the maneuver. The DC of this maneuver is your target's Combat Maneuver Defense. Combat maneuvers are attack rolls, so you must roll for concealment and take any other penalties that would normally apply to an attack roll. The special size modifier for a creature's Combat Maneuver Defense is as follows: Fine –8, Diminutive –4, Tiny –2, Small –1, Medium +0, Large +1, Huge +2, Gargantuan +4, Colossal +8. Some feats and abilities grant a bonus to your CMD when resisting specific maneuvers. A creature can also add any circumstance, deflection, dodge, insight, luck, morale, profane, and sacred bonuses to AC to its CMD. Any penalties to a creature's AC also apply to its CMD. A flat-footed creature does not add its Dexterity bonus to its CMD. Determine Success: If your attack roll equals or exceeds the CMD of the target, your maneuver is a success and has the listed effect. Some maneuvers, such as bull rush, have varying levels of success depending on how much your attack roll exceeds the target's CMD. Rolling a natural 20 while attempting a combat maneuver is always a success (except when attempting to escape from bonds), while rolling a natural 1 is always a failure. If your attack is successful, your target is pushed back 5 feet. For every 5 by which your attack exceeds your opponent's CMD you can push the target back an additional 5 feet. You can move with the target if you wish but you must have the available movement to do so. If your attack fails, your movement ends in front of the target. As a standard action, you can attempt to grapple a foe, hindering his combat options. If you do not have Improved Grapple, grab, or a similar ability, attempting to grapple a foe provokes an attack of opportunity from the target of your maneuver. Humanoid creatures without two free hands attempting to grapple a foe take a –4 penalty on the combat maneuver roll. If successful, both you and the target gain the grappled condition (see the Appendices). If you successfully grapple a creature that is not adjacent to you, move that creature to an adjacent open space (if no space is available, your grapple fails). Although both creatures have the grappled condition, you can, as the creature that initiated the grapple, release the grapple as a free action, removing the condition from both you and the target. If you do not release the grapple, you must continue to make a check each round, as a standard action, to maintain the hold. If your target does not break the grapple, you get a +5 circumstance bonus on grapple checks made against the same target in subsequent rounds. Once you are grappling an opponent, a successful check allows you to continue grappling the foe, and also allows you to perform one of the following actions (as part of the standard action spent to maintain the grapple). Move: You can move both yourself and your target up to half your speed. At the end of your movement, you can place your target in any square adjacent to you. If you attempt to place your foe in a hazardous location, such as in a wall of fire or over a pit, the target receives a free attempt to break your grapple with a +4 bonus. Damage: You can inflict damage to your target equal to your unarmed strike, a natural attack, or an attack made with armor spikes or a light or one-handed weapon. This damage can be either lethal or nonlethal. Tie Up: If you have your target pinned, otherwise restrained, or unconscious, you can use rope to tie him up. This works like a pin effect, but the DC to escape the bonds is equal to 20 + your Combat Maneuver Bonus (instead of your CMD). The ropes do not need to make a check every round to maintain the pin. If you are grappling the target, you can attempt to tie him up in ropes, but doing so requires a combat maneuver check at a –10 penalty. If the DC to escape from these bindings is higher than 20 + the target's CMB, the target cannot escape from the bonds, even with a natural 20 on the check. If You Are Grappled: If you are grappled, you can attempt to break the grapple as a standard action by making a combat maneuver check (DC equal to your opponent's CMD; this does not provoke an attack of opportunity) or Escape Artist check (with a DC equal to your opponent's CMD). If you succeed, you break the grapple and can act normally. Alternatively, if you succeed, you can become the grappler, grappling the other creature (meaning that the other creature cannot freely release the grapple without making a combat maneuver check, while you can). Instead of attempting to break or reverse the grapple, you can take any action that doesn't require two hands to perform, such as cast a spell or make an attack or full attack with a light or one-handed weapon against any creature within your reach, including the creature that is grappling you. See the grappled condition for additional details. If you are pinned, your actions are very limited. See the pinned condition in Conditions for additional details. Multiple Creatures: Multiple creatures can attempt to grapple one target. The creature that first initiates the grapple is the only one that makes a check, with a +2 bonus for each creature that assists in the grapple (using the Aid Another action). Multiple creatures can also assist another creature in breaking free from a grapple, with each creature that assists (using the Aid Another action) granting a +2 bonus on the grappled creature's combat maneuver check. When you attempt to overrun a target, it can choose to avoid you, allowing you to pass through its square without requiring an attack. If your target does not avoid you, make a combat maneuver check as normal. If your maneuver is successful, you move through the target's space. If your attack exceeds your opponent's CMD by 5 or more, you move through the target's space and the target is knocked prone. If the target has more than two legs, add +2 to the DC of the combat maneuver attack roll for each additional leg it has. You can attempt to sunder an item held or worn by your opponent as part of an attack action in place of a melee attack. If you do not have the Improved Sunder feat, or a similar ability, attempting to sunder an item provokes an attack of opportunity from the target of your maneuver. If your attack is successful, you deal damage to the item normally. Damage that exceeds the object's Hardness is subtracted from its hit points. If an object has equal to or less than half its total hit points remaining, it gains the broken condition (see Conditions). If the damage you deal would reduce the object to less than 0 hit points, you can choose to destroy it. If you do not choose to destroy it, the object is left with only 1 hit point and the broken condition. Feinting is a standard action. To feint, make a Bluff skill check. The DC of this check is equal to 10 + your opponent's base attack bonus + your opponent's Wisdom modifier. If your opponent is trained in Sense Motive, the DC is instead equal to 10 + your opponent's Sense Motive bonus, if higher. If successful, the next melee attack you make against the target does not allow him to use his Dexterity bonus to AC (if any). This attack must be made on or before your next turn. When feinting against a nonhumanoid you take a –4 penalty. Against a creature of animal Intelligence (1 or 2), you take a –8 penalty. Against a creature lacking an Intelligence score, it's impossible. Feinting in combat does not provoke attacks of opportunity. Mounts in Combat: Horses, ponies, and riding dogs can serve readily as combat steeds. Mounts that do not possess combat training (see the Handle Animal skill) are frightened by combat. If you don't dismount, you must make a DC 20 Ride check each round as a move action to control such a mount. If you succeed, you can perform a standard action after the move action. If you fail, the move action becomes a full-round action, and you can't do anything else until your next turn. A horse (not a pony) is a Large creature and thus takes up a space 10 feet (2 squares) across. For simplicity, assume that you share your mount's space during combat. When you attack a creature smaller than your mount that is on foot, you get the +1 bonus on melee attacks for being on higher ground. If your mount moves more than 5 feet, you can only make a single melee attack. Essentially, you have to wait until the mount gets to your enemy before attacking, so you can't make a full attack. Even at your mount's full speed, you don't take any penalty on melee attacks while mounted. If You Are Dropped: If you are knocked unconscious, you have a 50% chance to stay in the saddle (75% if you're in a military saddle). Otherwise you fall and take 1d6 points of damage. Without you to guide it, your mount avoids combat. A splash weapon is a ranged weapon that breaks on impact, splashing or scattering its contents over its target and nearby creatures or objects. To attack with a splash weapon, make a ranged touch attack against the target. Thrown splash weapons require no weapon proficiency, so you don't take the –4 nonproficiency penalty. A hit deals direct hit damage to the target, and splash damage to all creatures within 5 feet of the target. If the target is Large or larger, you choose one of its squares and the splash damage affects creatures within 5 feet of that square. Splash weapons cannot deal precision-based damage (such as sneak attack). You can instead target a specific grid intersection. Treat this as a ranged attack against AC 5. However, if you target a grid intersection, creatures in all adjacent squares are dealt the splash damage, and the direct hit damage is not dealt to any creature. You can't target a grid intersection occupied by a creature, such as a Large or larger creature; in this case, you're aiming at the creature. You never get back the time you spend waiting to see what's going to happen. You also can't interrupt anyone else's action (as you can with a readied action). Initiative Consequences of Delaying: Your initiative result becomes the count on which you took the delayed action. If you come to your next action and have not yet performed an action, you don't get to take a delayed action (though you can delay again). Readying to Counterspell: You may ready a counterspell against a spellcaster (often with the trigger "if she starts casting a spell"). In this case, when the spellcaster starts a spell, you get a chance to identify it with a Spellcraft check (DC 15 + spell level). If you do, and if you can cast that same spell (and are able to cast it and have it prepared, if you prepare spells), you can cast the spell as a counterspell and automatically ruin the other spellcaster's spell. Counterspelling works even if one spell is divine and the other arcane. Readying a Weapon against a Charge: You can ready weapons with the brace feature, setting them to receive charges. A readied weapon of this type deals double damage if you score a hit with it against a charging character.